Eye tracking or gaze tracking is a scientific method for capturing a person’s eye gaze. Eye tracking can be used to evaluate interactive applications, mobile applications or interactive products. Eye tracking is a valuable instrument to measure in which sequence and how long users look at certain parts in a user interface. That way eye tracking helps to identify which elements catch the users’ attention and which are ignored altogether. Before carrying out an eye tracking study we support you in formulating specific research questions and examine whether these questions can be answered with eye tracking. 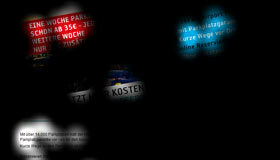 Eye tracking is especially powerful when it is used in combination with a traditional usability test. While the test participant is working on a realistic work task, such as ordering a product, we capture the user’s eye gaze with our eye tracker. That way we are collecting the users’ statements and objective eye gaze data. Both, the qualitative and the quantitative results are analyzed by our experts. What can we test with Eye Tracking? 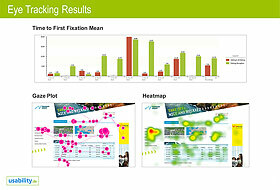 Heatmaps visualize how long or how often certain elements were looked at. Warm colors like red and yellow indicate areas which were looked at longer or which attracted more fixations. An opacity map is similar to a negative image of a heatmap. Areas that were not fixated on at all are shaded. Only non-shaded parts caught the users’ attention. 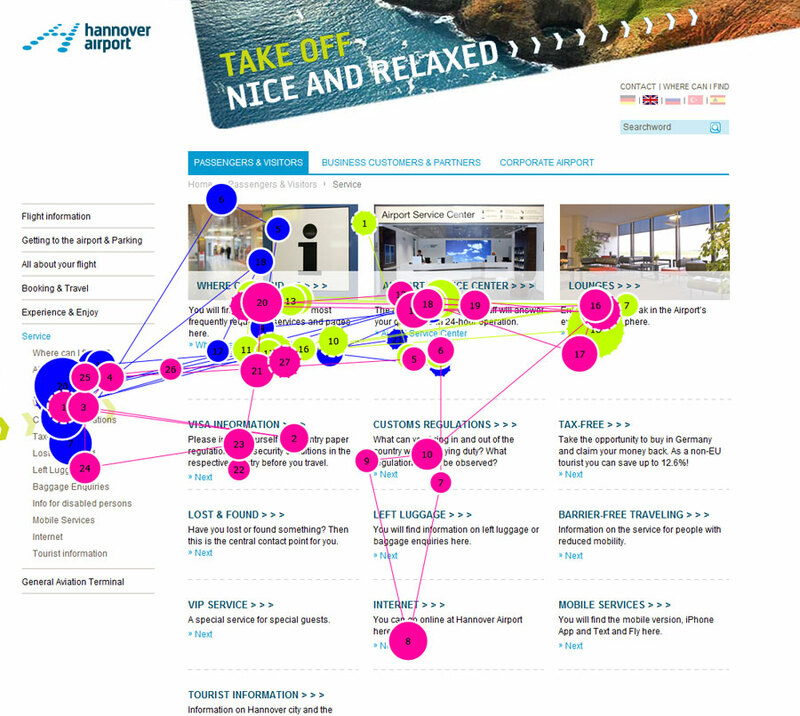 Gaze plots or scan paths visualize a user's gaze pattern through a series of dots. The sequence of the gaze points is indicated by numbers in the dots. The size of the dot represents the length of a fixation. What can we find out with Eye Tracking? Which elements on my website are being noticed by the users and which are ignored altogether? Which elements distract the users from the parts that are actually important? Which content elements are being read and which are only scanned? How long and how often do users look at certain elements (menu, navigation, advertisement) in an interface? In which sequence do users perceive elements in an interface? Does the site's structure enable users to find required information without having to search extensively? When do we recommend Eye Tracking? Pictures, colors and design have a huge influence on the human perception. That is why eye tracking studies should only be carried out when first graphical designs are available. 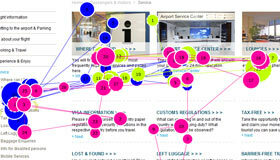 Eye tracking is especially helpful when multiple designs are to be compared. By carrying out a quantitative gaze point analysis, we can objectively identify the design that guides the search for information best. 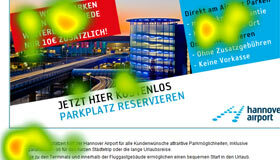 Great results can also be achieved by combining eye tracking and a classical usability test. 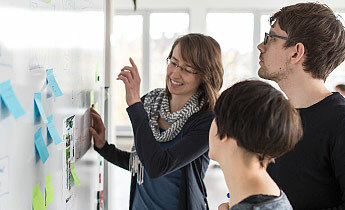 While representative users work on realistic work task, we are able to observe their gaze patterns and analyze decision making and perception processes in detail. Eye Tracking uncovers invisable perception and decision-making processes. 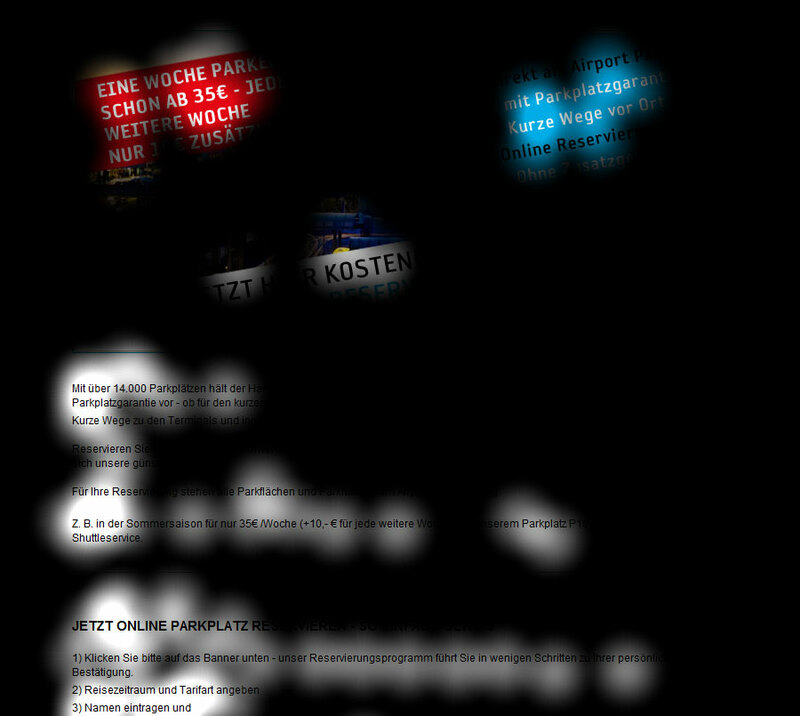 Apart from a description of the identified usability problems you receive graphic visualizations (e.g. 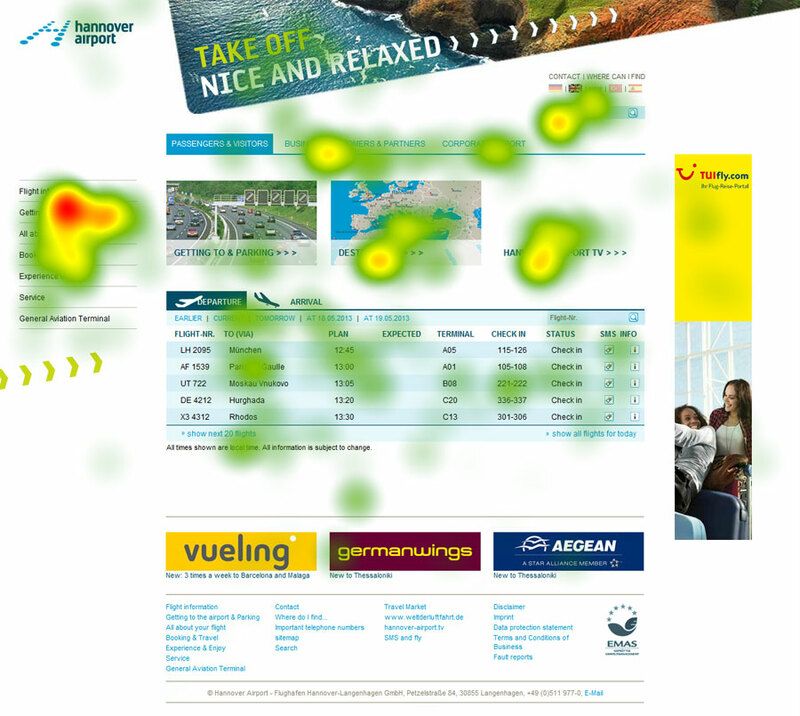 heatmaps or scan paths) of the eye tracking sessions. You can observe live how your users perceive your system. Assumptions about how the users interact with your system (e.g. “Nobody notices this anyway”) can be confirmed or proven wrong objectively. 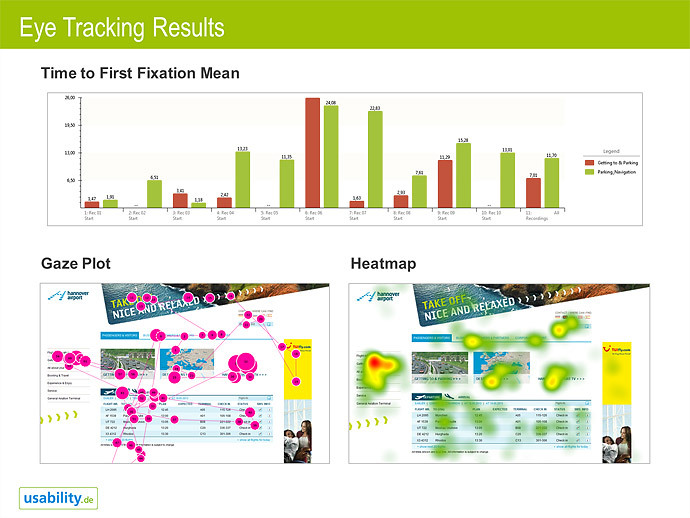 You will receive a well-structured report with all eye tracking results. The report contains: written problem descriptions, graphical analyses of the gaze tracking sessions (e.g. heatmaps or gaze plots), and in case of quantitative studies diagrams and spreadsheets with all relevant measurements. If needed we illustrate the optimal solution with best practice examples or develop custom designs that help you fix the problem. The highlight video shows your users in action: Key scenes from the test sessions illustrate critical usability problems. The test participants’ eye movements are visualized by a red dot. That way, you are able to experience your product through your users’ eyes and observe which elements catch their attention and which are ignored completely. To evaluate screen based applications we use remote eye tracking systems manufactured by Tobii Technology, the world leader in eye tracking technology. 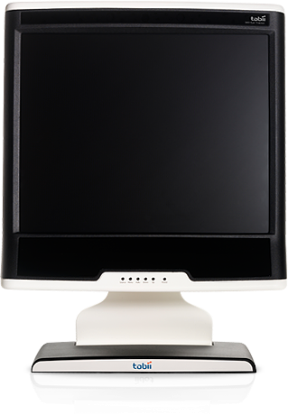 The eye tracking system is integrated into a regular computer screen. That way, we are able to create a natural unobtrusive testing environment. After a short 10 second calibration the test participant doesn’t even notice that his eye movements are tracked. 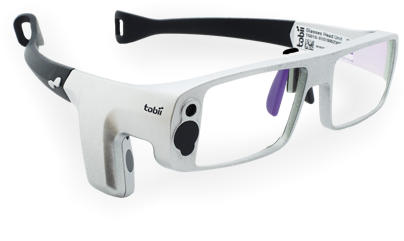 To evaluate other interfaces or products, we use Tobii Technology’s Eye Tracking glasses, which integrate an eye tracking system into a pair of glasses. The eye tracking glasses are lightweight and almost look like conventional glasses. 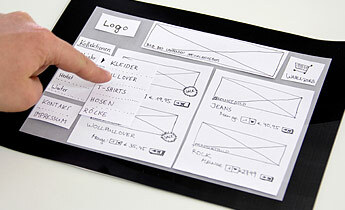 How do I profit from good usability?